Have you ever had one of those moments where you have no idea where you are but you just had to get a photo of the moment in time? That is how I was feeling this day. Deb and I were cycling to camp when we stopped at a lake to take in the extraordinary view of New Zealand's countryside. The water was the perfect colour of turquoise. It is exactly what I expected the glacial waters of New Zealand to look like. The sky was a deep blue and there was just enough cloud to give rich texture to the photo. A storm was blowing in causing a rainbow above the clouds. I decided to set up my camera and take a self portrait. My first one ever! It captures exactly what I was feeling that day, completely satisfied with life at this moment. I don't think I have witnessed such a stunning scene in all my travels and I wanted everyone to see what I had seen. I have no idea what the name of the lake is or what the mountains are called in the background but sometimes you just need to share a moment rather than a name and location. This trip to New Zealand is sponsored by the Flying Kiwi a great way to get around the country with fellow travellers. 30 Responses to "New Zealand’s Stunning Landscape"
New Zealand is beautiful. We were there a few years back and did a 2 weeks road trip – Saw some of the most beautiful scenery in the world there! New Zealand is so amazing, my favourite country visited. Everywhere you see, it’s breathtaking. This photo captures the moment and the beauty of the nature so beautifully! Stunning- I could sit and look at that view all day long, and then some….I really hope I make it to NZ someday (soon). Wow! Gorgeous photo. Bob and I set up the tripod and try to get similar photos of us different places. Some of those are my favorite photos of us! Thanks Jade, bringing the tripod on this last set of travels has been one of the best decisions I have made. it just seems like a dream… i’m in love! Thanks Serana. The sky and the landscape of New Zealand is a bit dream like. All of the colours are so vivid. You are welcome Jorie. Thank you for the comment. New Zealand is known for its incredible scenery no wonder it is a favorite of cinematographers. I have yet to go there but many films have been filmed there such as the Lord of the Rings trilogy, so i guess I will have to be satisfied with that until I can get there myself! Hi Karen, you are so right. It is a cinematographers dream here and we felt like we were in Middle Earth at every turn. TLOR’s definitely does a great job at capturing the landscape of New Zealand. Wow! What a gorgeous shot. This would certainly inspire me to go to NZ! Thanks Amanda, glad we could inspire. What a stunning photo, I love it. Thanks for the compliment Alouise. I literally said “Wow” when I saw this picture. Great job Dave! The colours really make everything stand out and maybe with the air being just a bit chilly it makes everything that much more crisp. It is difficult to put the camera down while traveling in New Zealand. Our fabulous guide Vinnie just told us where this photo is at. Lake Tekapo in the South Island. Thanks man! Oh wow! That is an absolutely gorgeous picture. It really looks like another world. Hi Verity, sometimes we feel that we are in another world here in New Zealand. The landscape is so diverse and it changes at every turn. This picture is so beyond amazing I seriously can’t even believe that it’s real. What a gorgeous photo. Love how the mountains and clouds stand out so sharply, and the rainbow! I was on a roadtrip around New Zealand for 3 months, and there were just so many beautiful spots there… I agree, after awhile it really was a whole ‘moment in time’ thing. I’ve got a whole page on my website dedicated just to New Zealand’s beautiful sunsets (www.faroutofoffice.com/sunsets-in-new-zealand-a-phlog/). 🙂 Looking forward to seeing more of your photos! Hi Cheryl, yes if we were driving ourselves we wouldn’t get anywhere. We would just keep pulling off on the side of the road to take a shot. Everywhere we go is absolutely beautiful. I will check out your sunset for sure! 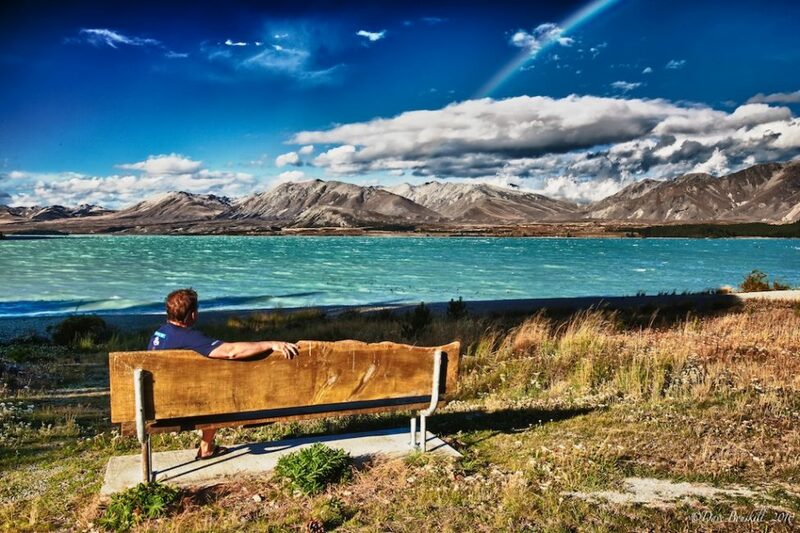 Great scenery,beautiful capture, amazing natural beauty new zealand is perfect place to visit for nature lovers. Thanks Tanveer. It is the perfect place for nature lovers and tramping (hiking) It seems that Kiwis are always outside enjoying the great outdoors.